JACKSONVILLE, Fla. - A Jacksonville businessman is leaning on friends after life dealt him some tough cards. Mark Braddock founded and launched 8103 Clothing in honor of his brother who died of a drug overdose in 2003. His dog, Walter, the mascot of his brand was recently diagnosed with canine cancer. And to make matters worse, Braddock's inventory was stolen this week. Braddock operates his pop-up store in downtown Jacksonville in the middle of tailgating Jaguars fans. 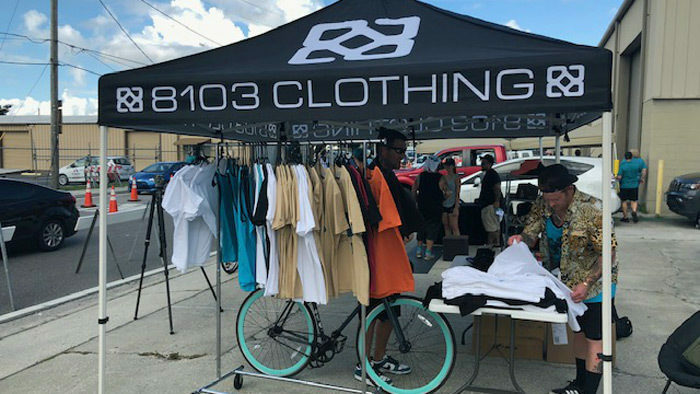 His business, 8103 Clothing, has become a staple on the corner of Duval and Talleyrand, but this Sunday the owner had a lighter inventory on hand, because someone stole $20,000 worth of merchandise from his car in Jacksonville Beach. "I left it unlocked, not the first time. I grew up in South Jacksonville Beach. Obviously times have changed. I made a horrible mistake. I am learning from it, and I am going to bounce back stronger than ever," said Braddock. It's not the first setback he's had to endure. He named his business in honor of his brother who overdosed on drugs. "1981 to 2003 is the birth and death year of my older brother," Braddock said. He takes solace in his beloved dog, Walter. "Walter has been the icon of the brand for the last 7 years. He has been all over t-shirts, music videos, he has been everywhere. He is more than just a dog, he is my best bud," said Braddock. A while back, he moved his business to California. "Well I was trying to create a new market place," said Braddock. Then tragedy struck again when his mother died suddenly in May of 2015. "She passed away from a heart attack. I found her, unfortunately, and I kept my store open for a year. Then, my dad broke the news he had cancer, and he passed away late 2016," Braddock said. Braddock then moved his business back to Jacksonville, when he got more bad news. This time it was his best buddy, his 8-year-old mascot, Walter who was diagnosed with canine cancer. "He has a small tumor on the right side of his brain." Despite all the setbacks, Braddock said he's not giving up. "You keep moving on, make new stuff." He's received a lot of love and support from friends and fellow pop-up business owners. "If I was in a rough spot, Mark would be there for me 100 percent. We have been friends longer than we've been competition. We don't care about making the same products. It's about helping each other out," said Teal We Die co-owners Noah Dellilo & Meagan Bryan. Braddock said police have not recovered his merchandise.He's taking things day-by-day and making the most of what time he has with Walter.